What Is I Ching Hexagram 57 All About? Hexagram 57 yijing represents the need to be persistent in any progress but to be gentle instead of forceful. Now is not the time for frequent breaks or deviation from a well thought out plan. Use this period to make steady progress towards an end goal. This hexagram shows the importance of being persistent with kindness and gentleness as abused to forceful working. A soft approach to any plans is what will lead to success. Forcing progress and being threatening towards those you encounter will only lead to a slower pace. 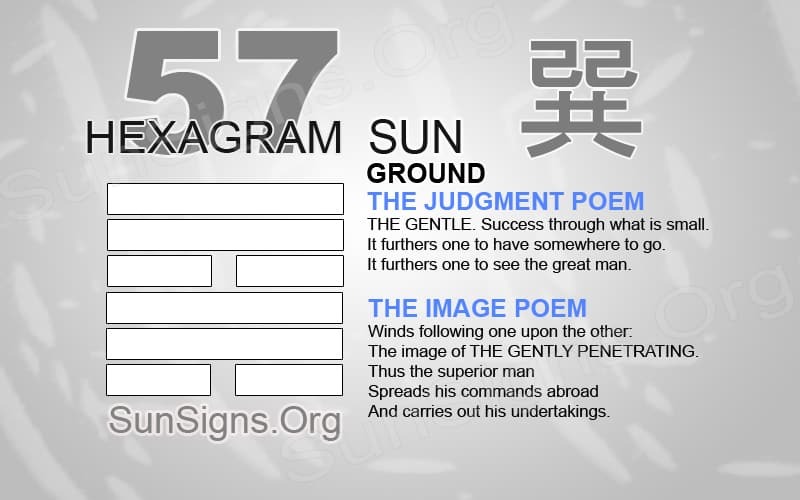 Hexagram 57 shows that you need the power to endure certain difficulties. You also need this to continue progress in a relationship or at the workplace. Thus, you need constant persistence to achieve success. Emotions are perhaps the hardest parts of our minds to control. They are in fact what define humans and their characteristics. Emotions can be a clear communication to another person. Based on our emotions, one can determine the outcome of a situation. Threatening others to hurry their work so you can progress is not an option. This will only lead to more trouble. An individual might be kind and gentle as they endure their journey. But, it is ideal not to let gentleness turn into a weakness. When enduring a period of progress, whether it is through a difficult time or one of success, it is important to approach the situation gently. If we let our emotions run ramped, it is difficult to make any progress. We should be kind to those we interact with and give time to consider any advice they might give. Then, it allows us to prepare for what is about to happen next. When developing a new relationship, it is important to start slow. And, then build a good foundation for the relationship to blossom. Trust is the key to any long lasting relationship. Take time to build upon this characteristic by being thoughtful and attentive to your partner. Showing kindness and gentle actions can allow a partner to become open; with clearer communication. But most of all, it’s important to be patient. All great things take time to build up and progress. If we try to rush a new relationship, it is unlikely to last. There is a difference between falling in love quickly and trying to progress the relationship to fast. Giving your partner time will allow the relationship to grow securely. If you want to see further progress in the work environment, it may take persuading others to see your perspective. It is difficult to influence others to see a project the way you do. Take this time to be persistent with your ideas once you feel comfortable enough to share them with others. Any new idea should be well thought out before offering it to others. Be gentle with the persistence and try not to force your ideas on others. Everyone sees the world differently. And, it may take a while before you have your colleagues over to your side of thinking. Whatever type of progress you are looking to make, do so with steady persistence. This shows gentleness instead of the forcefulness of rash emotions. All great things come to view through time. Sometimes, you do not obtain it quickly. Have a kind heart but a clear, stable mind that will help anyone to make the appropriate choices. Hexagram 57 says that you should be able to become aware of possible dangerous paths.